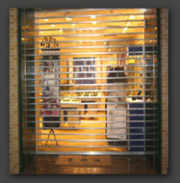 Rolling Security Grilles are chosen to safeguard exterior and interior openings in just about every type of store. They can also be found in pharmacies, airports, banks, stadiums and other public access areas such as parking garages where their distinctive combination of strength and open visibility is preferred. Self-supporting, and constructed from strong, lightweight aluminum, Rolling Security Grilles provide reliable protection against break-ins, theft and vandalism. 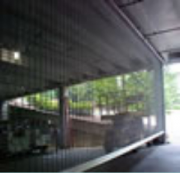 Ideal for car parks, our rolling grilles provide open viewing and appeal, while maximizing protection of your property. They conveniently roll up above the protected entrance without a trace, use only their own footprint for space requirement and can secure openings of virtually any width. We offer a wide selection of rolling grille options, including motor, push-up, chain or crank operation. While a clear anodized finish is standard on our bottom bars, we also offer custom finishes on curtains, bottom bars and guides. Our Aluminum Roll Down Shutters combine security and weather protection with modern engineering and (optional) wireless electronics. Manufactured from high quality 6063 T-5 powder coated aluminum, the heavy duty MaestroShield® system comes ready to install with 56mm extruded aluminum slats, cast aluminum side brackets, 3 to 4mm side profile and is designed to keep the windows and openings of homes and businesses fully protected from high-speed winds, wind borne debris, harmful UV rays and intrusion. Available in Shutter-in-a-Box format or custom cut, this product can be ordered in manual, motorized and electronic versions. Sliding Security Grilles provide uncompromising security against break-ins, theft and vandalism. Grilles protect stores, pharmacies, airports, banks, stadiums, schools, corridors and public access areas throughout America. Easy to install during construction or renovations, grilles are customized to your application and are available in a variety of design and operational alternatives. We also offer options such as Emergency Egress Doors and custom finishes. Any sliding or rolling security grille may be effectively utilized behind glass, affording you an attractive array of alternatives to iron gates or other unsightly options. Our rolling grilles render optimum visibility, "showcase" the merchandise they protect, and are available in several appealing styles. Metro grilles also secure openings of virtually any width, promoting the type of expansive, inviting entrances that help draw customers into the store.